A very dark and deep poems.....Like it so much!!!! 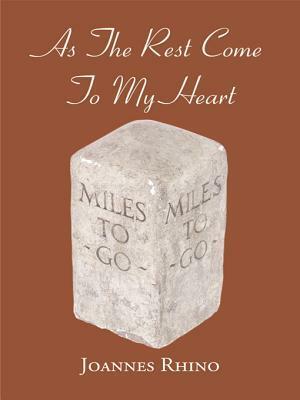 As The Rest Come To My Heart is an interesting collection of poems if you're a native English speaker like myself. It's an uncommon thing to see an author who clearly speaks English as a second language use it to deliver powerful and interesting poetry like the 34 poems found in this book.There's no getting round the fact that the bulk of As The Rest Come To My Heart is quite dark stuff, revolving around notions of death, depression, grief and loss. Some of the poetry takes on an outright supernatural tone, but what struck me more was the use of religious symbolism and references. Apparently this poetry stems from a particularly dark period in the author's life and I find it quite interesting to see how he has woven elements of faith and religion through these poetic depictions of his thoughts and troubles – both from an adversarial, questioning stance but also, particularly later on in the collection, a tone and manner that expresses a growing acceptance.In fact, the collection follows this change in tone across its whole extent; towards the end of the book, it's notable that the subject matter of the poetry shifts and the tone also changes. We see a transmutation from despair, hollowness and blood through to questioning faith and then to love and passion. As The Rest Come To My Heart still isn't what I'd call upbeat, even here, dwelling over the torment and confusion that can come with love and lust, but in its final passages we finally see poems that, perhaps, herald the breaking of dawn in the author's mind – a shift into a more serene, hopeful tone that may have matched his own ascent out of the years of darkness.What's most impressive about As The Rest Come To My Heart is that, as I first noted, it's written in a second language but still convincingly covers such a range of themes and speaks to the reader of the despairing quandaries and questions that the author has faced. Unfortunately, this is also the collection's weak spot – it does need an editor's gaze to amend some of the odd or incorrect use of words and grammar that can obfuscate and confuse the author's intent rather than deliver it clearly. In some of the poems, this can be quite a serious issue that trips the reader's comprehension and thus breaks the flow of the poetry.Poetry is a message from the heart and soul, but it still needs to be delivered through the base medium of text. As The Rest Come To My Heart certainly delivers on the former, but falls down somewhat on the latter. At its best, this collection is dark and questioning, offering an interesting chart of the writer's passage through troubled times, and hopefully it heralds more of the same in the future from this author. What awaits us there, behind the mysterious veil of death and for what purpose do certain gruesome events hauling our lives as onerous burdens emerge? These are the main problems brought up in this book. The idea of the afterlife can be observed almost in all the verses. Mind – you have to read between the lines. The theme of anxiety, unendurable pangs of remorse and ignorance of the future day is portrayed through the use of figurative images and diverse allegories which create a gloomy, solemn and enigmatic atmosphere in each verse. The author is trying to convey the message that our whole life is a dream this and mortal coil might very soon vanish. What will we be left with face-to-face with our soul? And still I can feel that in the final line of the verse the author gives us a spark of light and hope saying that even when you are on the edge of giving everything up, we can’t but extricate ourselves from the overwhelming difficulties. We have to struggle to live a better life, become better. Johannes Rhino writes that these poems came to life during a troubled time in his life. Even if the reader didn’t know this before reading them, it becomes quite apparent, quickly. They are dark. Not Stephen King dark, even though the poems do include vampires and hell. My heart wasn’t thudding in my chest afraid. Instead it felt the pain of the author. The questions, fear, remorse, and desire for salvation. And his poems show that even dark prose has glimpses of beauty. This is my second book I’ve read by Rhino. Unlike his novel, The Unseen Face (which is also good), this collection shows his intellectual depth. And considering he’s not a native English speaker, his command over the language is impressive. For readers looking for something different, I recommend this collection. This is a dark, and deep collection of poetry. Now before you go running away allow me to clarify. I don't mean deep as in Edgar Allen Poe deep where you are either scared or still trying to understand what you read; and when I say dark I don't mean 80's/90's emo "dark". This is a cohesive collection that will lead you through the authors life. To often does the description of "deep and dark" scare people away, yet I found many poems that I could relate to. Deep and dark also do not indicate a lack of beauty, in fact it is quite the opposite. There is great beauty in these dark poems, from the insight to his mind, to the very words he uses and how they tie together. I would absolutely recommend this to anyone even if you hate poetry, doesn't hurt to try. As the Rest Come to My Heart is a collection of poems narrating a time of intense grief, depression, and fear the author endured. I was captivated by the voice of Rhino and felt his emotion, his state-of-mind. I felt the rawness of his pain and rage so clearly; his words stirred memories of my own rage--that feeling of injustice that kills you inside and nothing eases the pain. A poet can erase the differences of time, distance, gender, and culture, and strip the reader down to emotion and connection, and this collection did that for me.I enjoyed Rino's poetry, and it left me wanting to know more. I recommend this book to anyone who enjoys poetry, or who wants an introduction into poetry to see what it's all about. I am not normally a poetry reader, but after reading some of Joannes' other works I really wanted to explore how versatile this author is. I will warn you now, if you don't like Vampires, Hell, or the dark and macabre, don't read this collection. This was a perfect reading for Halloween. Joannes is not a native English speaker, but his command of the English language to elevate his poetry is note worthy. He takes ordinary words and creates a story around them, and in this collection, many of the stories are sad and seem to really come from a personal place. There are authors who write to write, and those who feel they must write, and I believe Joannes falls into the latter category. I look forward to future works by him. It's a sad known fact that some people think that poetry is a lost and forgotten art, a thing of the past - Not so...This prose will surely be taken to heart by anyone reading it. We all encounter, loneliness, depression, rage, and heart break. Rhino's voive speaks with such overwhelming emotion that touches us all in ways we understand. The poetry in this book is beautifully written in its extreme vastness. A collection of versatile words about darkness, and creativity style that is somewhat painful in parts but I and I'm sure everyone else that reads this work, can definitely relate to its meaning. I recommend this. For a non-native English speaker this collection of poetry is written quite well and provocatively. I agree with another reviewer that this collection would be good for Halloween because of references to Hell, vampires, and other dark creatures and subjects. But I also think that this may be good for religious people too. I'm religious and I was enrapt with several of the poems about the devil and keeping/losing your soul. This author is versatile (I reviewed his novel The Unseen Face), which is always a good thing, because by being versatile, an author can bring more to any book or poem. I would definitely recommend "As the Rest Come to My Heart"! Joannes Rhino's poetry book As the Rest Come to My Heart is written in deep, provocative, dark tones which immerse the reader into the depths of the rhymes of his heart. He shares the poetic justice of a broken soul longing for redemption along with the injustice of the way people treat those filled with brokenness.Rhino's poetic voice can echo through space and time. As an editor and author, I recommend his poetry book to anybody who is broken and lost within their own depths of sorrow and emotions.-Hepzibah Nanna, editor and author. It is a brave man who bares his soul during his deepest, darkest hours and Johannes Rhino has done this with elegance and force. They focus on death depression, grief and loss with supernatural overtones tones. They traverse a spectrum of emotions as the tone changes and shifts.Quite frankly I found this collection of poems stunning and am so pleased that he is keeping alive the tradition of great poetry. One of the best poems collections I have ever read. I’ve started reading this book 2 days ago and I couldn’t stop until I finished it. I was really fascinated, the plot was overwhelming and Joannes Rhino found the perfect end to this book. I anxiously awaited the outcome of the book, which was unexpected and extremely unpredictable. I totally get the message of the poems that the author wants to say. It intrigues me to read all his poems. I can draw a conclusion that this is the very worst moment of his life. I give him thumbs up for his effort in being implicit. I really like the poems. Pretty much dark, but I get the point. Totally. I don't really like poetry. But I have this book anyway. This collection of poems were made during the most troublesome moments in my last 10 years of life. I was covered by dark clouds at the time. Anger, anxiety, emptiness, guilt and lost love collected into a single unstoppable emotion. Joannes Rhino - Joannes Rhino was born in Indonesia in 1980.He was educated at the local state school until graduation in 1998 and continued to study in Hospitality University. He was then employed by a financial company, where he began to receive many awards related with customer satisfaction. Having been working the same routine for years, he started to write a novel to kill the time. Finally, his first novel “Etzhara” was published by the biggest traditional publisher in Indonesia and made him one of the best young writers under thirty at Khatulistiwa Literary Award in 2009. Feeling confident with the writing skill he has, he published the second novel in the same year by another traditional publisher in Jakarta. He then began to receive many invitations to attend book signings, talk shows, radio interviews, and other literature activities. This second novel made him an overnight success.Feeling secured in terms of financial and social life, he felt something was missing. The turning over point of his life had occurred when someone handed him a novel by Paulo Coelho “The Alchemist” and a motivational book by Rhonda Byrne “The Secret”. Those books really changed his perspective about life, and that was when he decided to let go of the glamorous life of Jakarta and hit the road. He was 30 at the time. That year, he self-published a collection of poetry in the United Kingdom. This poetry collection was made during the most troublesome moments of his last 10 years of life, when dark clouds enveloped him. Anger, anxiety, emptiness, guilt and lost love coalesced into a single, unbearable emotion.With all the savings he got from the previous job and book royalties, he traveled to Bali and worked for a timeshare company. Three months was all he needed to understand that it was not what he wanted. He then changed course to a publishing company as an Editor in Chief. As much as he loved dealing with words, his passion to see the world kept haunting him. Finally, he decided to travel to Australia and Thailand for 8 months. It was between 2011 and 2012 when he tried to fit in with a new life; working from farm to farm, hitchhiking from place to place, and volunteering from school to school. He went all around Australia and returned to Bali with tons of stories to tell.During his journey in Australia, he had written two other novels and got rejected from several publishers in Indonesia because the content was not sell-able. Therefore, he translated to English and self-published them with a USA publisher. This huge change made him an international author. However, this achievement did not stop him from pursuing his literature obsessively. He is now working freelance as a ghostwriter, copywriter and scriptwriter.He is based in no place, as he is still in a search for a place to be called “home”.